When I obtained this 1978 card I was 10 years old and as extroverted as I’d ever be. The world was small and warm most of the time, a roaming comfort zone of home and the hippie classroom that I’d been in for a few years and, of course, the little league field, and in that comfort zone I was a chatterbox and a joiner and a doer, all elements of my personality that fell away in years to come as I gradually donned the ashen costume of the apprehensive cipher. At home my brother and I talked so much about baseball that the weary adults of the house eventually decreed a moratorium on all baseball talk at the dinner table; I also talked so much in general that my sometime baseball-talking partner, as he edged into the silence-filled vales of puberty, had to institute his own unofficial policy of threatening glares and occasional arm-punches to get me to shut up. At school I was either talking with my friends or making (no doubt tiresome and unfunny) wisecracks to the teacher or plunging into projects like co-writing and directing a theatrical sequel to Star Wars that we put on for our classmates (I played Darth Vader and got to kill off Princess Leia) or overseeing (or at least pretending to oversee) the staging for a general public audience of the Broadway musical You’re A Good Man, Charlie Brown. The small local paper, which was run by my aunt’s brother Dickie, even published a small write-up about me on the eve of the latter performance. It was a short paragraph in the back pages, wedged in between local notes relating that some village octogenarian or other was recently visited by relatives. I don’t remember the content of the article but recall that it mentioned that I was 10 in the context of a general appreciation for all I was accomplishing at such a young age. Here was a kid bound for big things! It was all sort of downhill from there. I peaked at 10. The slide from that peak may have begun with the performance itself, which must have been an excruciating, incomprehensible mess to watch. I had hacked the script to bits for a couple ridiculous reasons. First, because I didn’t know how to sing and didn’t like to sing, I got rid of all the songs, just deleted them. A musical without music! Then, upon realizing that no one was going to be able to remember all their lines, I chopped off the entire second half of the play. I guess we stumbled through a few musicless scenes and at the abrupt, inconclusive end all the surely bewildered parents in folding chairs applauded, but the whole experience left me feeling a little shaky. Apprehensive. Like maybe center stage wasn’t the greatest place to be. I got glasses around that time, big girly-framed plastic jobs that combined with my unruly long curly hair and weakling body to make me a pretty easy target of scorn outside my comfort zones, such as when I walked to the general store to buy baseball cards. I tried in such situations to be as invisible as possible. As the years went by my courting of invisibility increased as all my comfort zones eroded. At home my parents were no longer around much, letting go of their dreams of back-to-the-land self-sufficiency to take regular (and poverty-averting) jobs, and my brother became less and less willing to waste his time with me; and the hippie school tossed me out of its embrace and into regular junior high; and little league ended. The year after little league, I took a small part in the 8th grade play. Maybe I was casting around for something to fill the void. Maybe I was trying to reconnect with my former, outgoing, happier self. The terror I felt in the hours leading up to the one and only performance of that play were extremely intense, and when the play was over the euphoria I felt was only that I wouldn’t have to go through such an ordeal again, which I didn’t. From that point on, I avoided situations whenever possible in which I would be center stage. The one aberration in this lifelong policy was during the two years when I was an adjunct professor. The terror and dread that preceded every class never really abated during that time, and since then, I haven’t tried to teach again, even though it was, at least sporadically, the most meaningful job I ever had. Surely part of the reason I haven’t is that being in any kind of spotlight scares me. And now I wonder if I’ve grown addicted to invisibility, to retreat. So I turn today to Brian Downing for a little help. 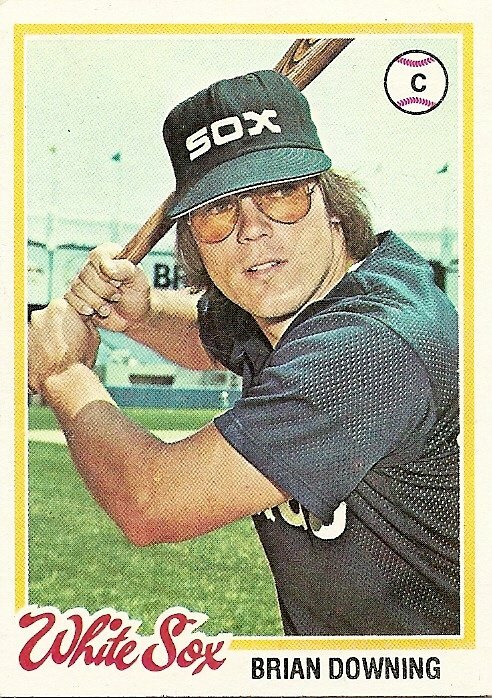 Here he is, in his tinted aviator shades and mesh, the same partially obscured Brut billboard in the background that was in the background of Ron Schueler’s card. Even though the viewer of both cards would assume from the identical backdrop and team name on the cap that Brian Downing and Ron Schueler shared the same moment with a Topps photographer, the two were never teammates. While newly acquired White Sox pitcher Ron Schueler was wrapping up the last two years of his career as a roaming adjunct, Brian Downing, now of the California Angels, was beginning to shuck off the costume of invisibility that had cloaked him throughout his years with the White Sox. It happened gradually. In 1978 he seemed the same innocuous weak-armed part-time backstop he’d always been, then in 1979 he batted .326 and made the all-star team, which seemed like a once in a lifetime aberration over the next two seasons, during which he hit .258 with 11 home runs. And then, suddenly, a whole new guy. I’m wary of inadvertently copying the great writing Bill James did on this very subject in his New Historical Abstract, but it’s sort of hard to tell the Brian Downing story without marveling Jameslike at the way Brian Downing suddenly transformed himself from the marginal regular-looking guy seen in the card at the top of the page into a bulging specimen worthy of the nickname listed for him on his page at baseball-reference.com, “The Incredible Hulk.” Anyone looking at his 1978 card and at the stats on the back of the card would have predicted that he’d have vanished from the league by the early 1980s, but instead he spent the entire decade swatting home runs (20 or so every year) and clogging the bases by virtue of his good batting average and ability to both draw walks and get hit by numerous pitches, the latter feat somehow a defining trait in that each of the errant throws, at least in memory, seemed to bounce impotently off his muscle-bound frame like punches off a brick wall. I think the famous turnaround has been the subject of scrutiny in recent times, these days when nobody can grow a muscle or hit a home run without raising suspicion. But I’m going to leave all that aside and not only give Brian Downing the benefit of the doubt but turn to him, as I turn to all these cards, for strength. In this life song gives way to song unless you edit the songs out, and weakness gives way to weakness unless you find a way to draw on strength from somewhere. I think now of one particularly desperate point in The Catcher in the Rye, when Holden Caulfield is crossing a street in the city and he starts convincing himself that he’s going to disappear before he reaches the other side. He calls out in his mind to his dead younger brother, Allie, the one who used to write poems all over his baseball glove so he’d have something to read in the outfield between pitches. Allie, don’t let me disappear. Allie, don’t let me disappear. You are currently browsing the archives for the Brian Downing category. Innocents, Accidents . . .